Fruit tarts are abundant in “The Art of Fine Baking.” They are some of the most seasonal recipes throughout the book and as the high season for blueberries approaches (though a bit late this year), it seemed like an obvious choice for this classy summer dessert. 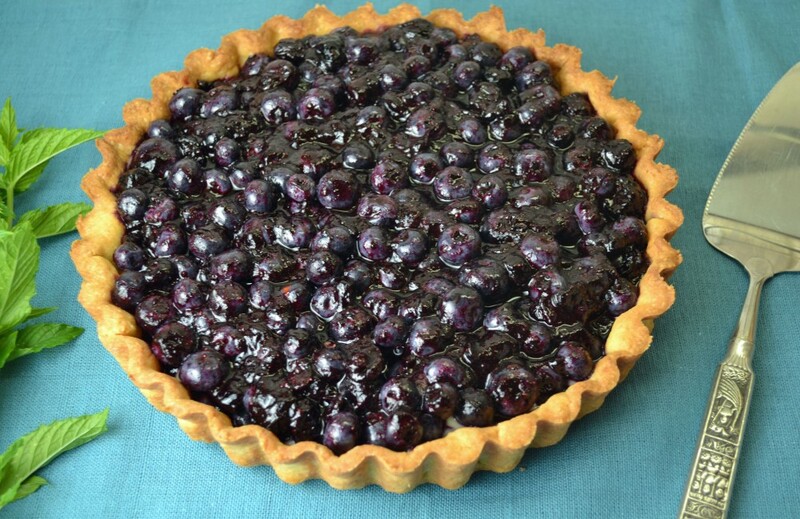 It’s also the only time of year that blueberries are affordable enough to make a whole tart full of them. Frozen just will not do and for those of us berry addicts, this tart is a delicious delivery method for these healthy bursts of juice. We made a fair number of fresh fruit tarts with blueberries in culinary school, but none quite like this. In addition to my grandmother’s exceptional rich tart pastry dough (lemon zest and hard boiled egg yolks are key), a quick pseudo jam is made with half of the fresh blueberries and then combined with the remainder. This not only adds an additional layer of texture and flavor, but also a sweetness that can help balance out any berries that maybe slightly under ripe. With all this decadence, a layer of pastry cream maybe overkill. But I can’t seem to resist the urge to add the sweet cream with a touch of almond paste, even if only so that I can eat the leftovers with just a spoon. The star of the show though, remains the blueberry tart – with each ingredient perfectly distinguished in every bite. Preheat oven to 350 degrees. Place chilled pastry in oven, taking it directly from freezer or refrigerator so it is as cold as possible. Prick bottom all over with a fork. Prick 3-4 times during first 10 minutes of baking to prevent bottom of pastry from puffing up. If sides of pastry should sink down during first 10 minutes of baking, simply press them back with a fork. Bake for a total of 25 minutes, or until shell is golden brown. In a heavy saucepan, combine 1 1/2 cups blueberries, sugar, lemon zest and juice, and cinnamon. Cook over low heat, stirring until sugar is dissolved. Raise heat and boil rapidly about 8 minutes or until blueberries thicken and acquire the consistency of jam. Cool. Combine raw blueberries with cooked jam, mixing gently. Spread a thin layer of pastry cream (if using) on the bottom of the baked tart shell. Combine raw blueberries with cooled jam, mixing gently. Spoon into tart shell. Sorry for the delay, 350 degrees F.